Wait, there's another island with more zombies? It's another release day Tuesday, and while there's nothing out today on par with BioShock Infinite, both Dead Island Riptide and Star Trek PC downloads have a respectable 20% discount at Green Man Gaming. For our friends outside North America, the games won't release until Friday, April 26th, but you can still take advantage of the 20% off coupon, and with Dead Island Riptide you'll get the preorder exclusive Survivor Pack DLC bonus (xp/stat boost, BBQ Blade, and discount in-game weapons shop). 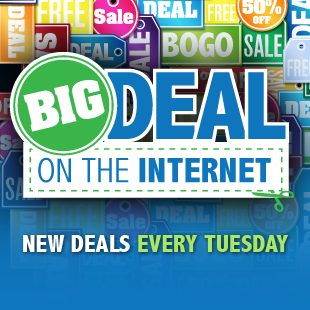 Groupon's got another gaming deal this week. Tomb Raider for the consoles is down to $40 - a new low by $2, and $5 off the current next best price. Until a month ago, this game never dropped below $48. This series reboot has garnered stellar reviews - both IGN's official and community ratings are currently above a 9, with the official review characterizing the title as "a greatly successful origin story, a series reboot that feels both authentic and hugely exciting". The deal runs through Thursday, or while supplies last. Monday GamersGate launched their 2 week long PC Download Spring Sale. Dozens of games are on sale, with four new "Deals of the Day" refreshed daily and plenty of other bundle offers and weekly sales. The Tuesday-only offers are Red Orchestra 2: Heroes of Stalingrad Digital Deluxe Edition for $3.74,Final Fantasy XI: Ultimate Collection: Seekers Edition for $9.99, Front Mission Evolved for $4.99, and Tropico 4 Collectors Bundle for $12.49. Other notable deals are The Cave for $5.10 and Alpha Protocol for $3.74 - both are normally $14.99. Dead Island Riptide (PC Download) - $32 at Green Man Gaming. List is $40. Deal expires April 26. UK price is Â£28 after voucher (normally Â£34.99). Star Trek (PC Download) - $40 at Green Man Gaming. Releases April 26. List is $50. Deal expires April 26. UK price is Â£32 after voucher (normally Â£39.99). Tomb Raider (Xbox 360, PS3) - $39.99 at Groupon. New low by $2, and next best is $45 at Amazon. Deal expires April 25. Four new "Deals of the Day" every day, bundle offers, and week-long game discounts. Bioshock Infinite (Xbox 360, PS3) - $49.99 at Best Buy. Next best is $58 at Overstock.com. Deal expires April 27. This is the cheapest we've seen the console version of the game since its much-celebrated release a month ago. BioShock Ultimate Rapture Edition (Xbox 360, PS3) - $19.99 at Best Buy. New low by $9 with a list of $30. Deal expires April 27. Halo 4 (Xbox 360) - $36.59 at Amazon. Next best is $40 at GameStop. God of War: Ascension (PS3) - $39.99 at Amazon. New low by $5, with next best of $58 at Overstock.com. Deal expires today. Hitman: Absolution (PC Download) - $19.99 at GameFly. Next best is $30 at GameStop. Deal expires April 25. Medal of Honor Warfighter (PC Download) - $10 at Amazon. New low by $2, and next best is $15 at GameStop. The Walking Dead Game - All Episodes (PC Download) - $10 at Origin. Elder Scrolls V: Skyrim - Dragonborn (PC DLC) - $9.99 at GameFly. Next best is $20 at Green Man Gaming. Deal expires April 25. Worth mentioning, since this ties the lowest ever price we saw last week at GameStop. Simliar discounts on Dawnguard for $9.99 (normally $20) and Hearthfire for $2.50 (normally $5), also at GameFly. Mass Effect 3 (PC Download) - $8 at Green Man Gaming. Next best is $20 at Amazon. UK price is Â£6 after voucher (normally Â£15). Deal expires April 25. Mass Effect 2 is only $4 (normally $20). Medal of Honor Ultimate Digital Collection (PC Download) - $7.20 at Green Man Gaming. Next best is $30 at Amazon. Deal expires April 25. Chivalry: Medieval Warfare (PC Download) - $6.80 at Green Man Gaming. New low by $1, and next best is $25 at GameStop. UK price is Â£4.22 after voucher (normally Â£15.50). Deal expires April 25. 16 Bit Arena (PC Download) - $4.99 at Amazon. List is $10. Deal expires April 24. Warp (PC Download) - $4 at Green Man Gaming. New low by $1, and next best is $10 at Origin. UK price is Â£3.20 after voucher (normally Â£7.99). Deal expires April 25. Awesomenauts (PC Download) - $2.72 at Green Man Gaming. Ties previous low, and next best is $10 at GameFly. UK price is Â£1.90 after voucher (normally Â£6.99). Deal expires April 24. PS3 Super Slim 500GB God of War Ascension Legacy Bundle with God of War Saga - $279.99 at Amazon. Next best is $300 at Best Buy. Deal expires today. Xbox 360 Wired Controller - $26.99 at NewEgg. Hardly on sale and lowest price we've seen yet. Next best is $34 at Amazon. Deal expires April 24. Lenovo IdeaPad Y500 Gaming Laptop - $799 at Lenovo. Specs: Ivy Bridge Core i7-3630QM and GeForce GT 750M 2GB. List is $1,149. Deal expires April 24. Lenovo IdeaPad Y400 Gaming Laptop - $719 at Lenovo. Specs: Ivy Bridge Core i5-3230M and GeForce GT 750M 2GB. List is $1,099. Deal expires April 24.